Boldly Expressive! Music by Women! 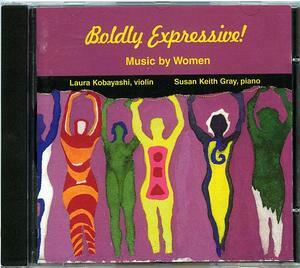 The Kobayashi / Gray Duo announces the release of its first compact disc, Boldly Expressive! Music by Women, on the Albany Records label. Violinist Laura Kobayashi and pianist Susan Keith Gray play works by six women composers of the nineteenth and twentieth centuries. This disc is a culmination of ten years of joint research and performances by the Duo of music for violin and piano by women composers. The composers represented on this disc are Rebecca Clarke, Marie Grandval, Johanna Senfter, Serra Miyeun Hwang, Barbara Heller and Grazyna Bacewicz. Their works are stylistically distinct and combine to show tremendous depth over the one and a half centuries represented. Clarke is the most well known composer of the set; Midsummer Moon displays her impressionistic style. Grande Sonate, Op. 8 by Grandval was discovered by Kobayashi in a collection of women's music at The University of Michigan libraries. She found a significant nineteenth century piece and worked with Gray to edit a modern edition for Hildegard Publishing Company (1998). Two short works by Senfter are in post-romantic style. In 1994, the Duo commissioned fellow doctoral student Hwang to write Allegory. Lalai by Heller was composed in sympathy for Iranian women prisoners during the reign of the Shah. The fifth sonata of Bacewicz is representative of a significant volume of music by this twentieth century Polish violinist, pianist and composer. The first four works on the disc are premiere recordings.